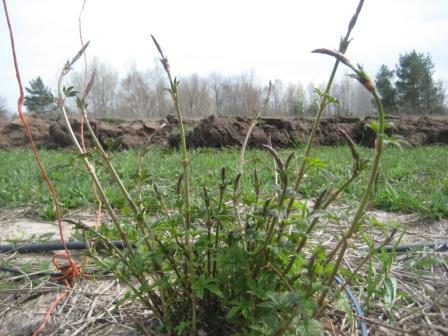 Hops is a perennial plant which dies back to the bare ground each winter, sends out shoots in early spring and grows like crazy until mid summer here in the northern midwest. 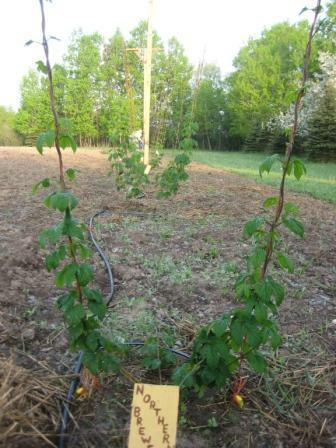 It is time to take a break from construction of the hopyard to chronicle the growth of our 2nd year hops plants thus far this growing season. April 9: The first signs of life. The purple shoot towards the center of the picture is a new shoot. 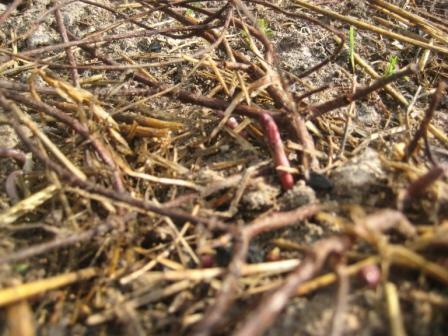 May 7: Robust growth of shoots has occurred. May 14: The bines are forming. The two strongest bines are selected to train onto the strings. The remaining bines are pruned. 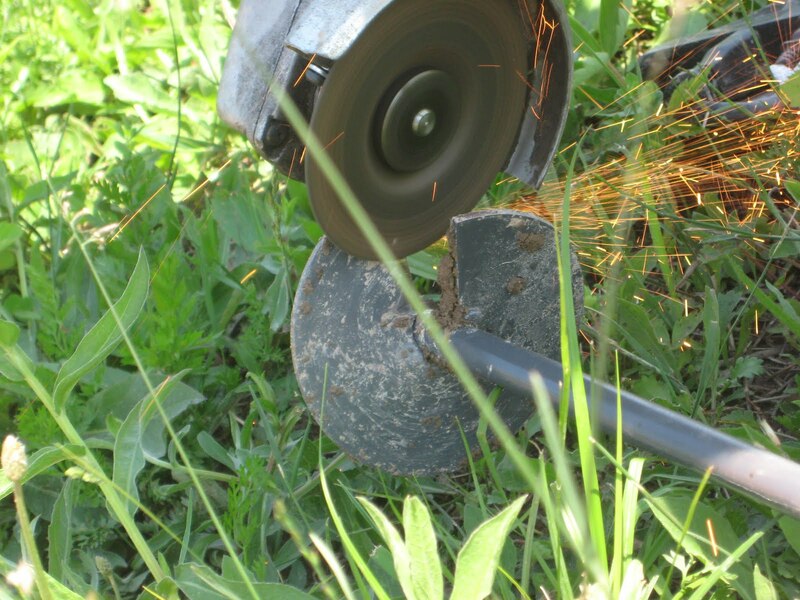 May 20: The selected bines begin to exhibit sturdy growth. May 21: Steady growth to reach the top of the trellis is occurring. 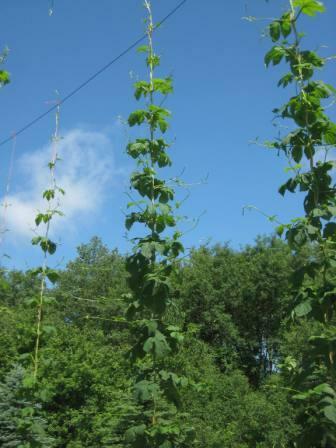 During this period the hops will grow up to one foot a day. 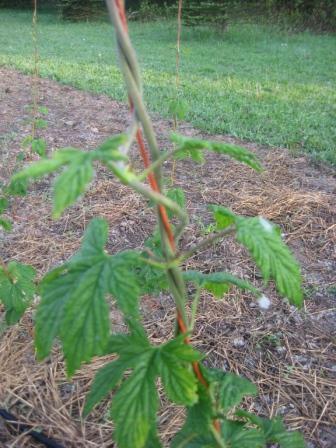 June 9: The bines have almost reached the top trellis line. Large leaves are forming on the lower sections of the bines. June 16: The bines have reached the sky. Side branches are forming at this point as well. The side branches are where the cones will form. June 17: The first flowers are forming. These will become cones in a few short weeks. July 9: Prolific growth has occurred. Side branches from neighboring plants are meeting each other. 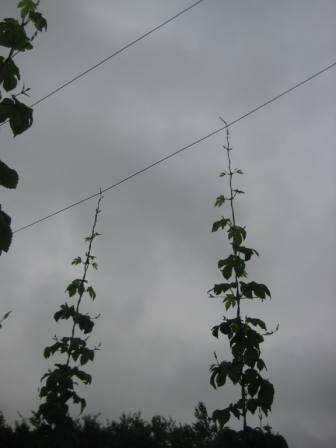 The tops of the bines are growing over the trellis and hanging off in the breeze. 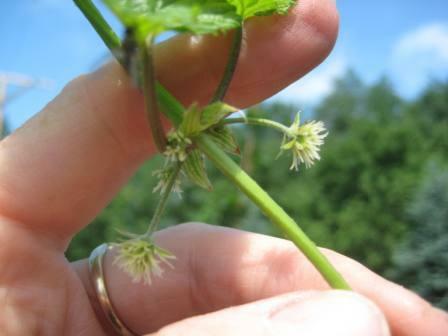 July 12: The flowers have formed into cones and will soon be ready for picking. Three short months yields very tall results. 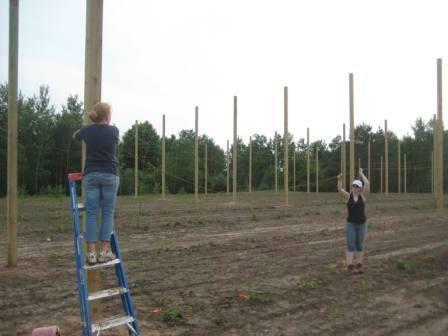 The poles are all planted. 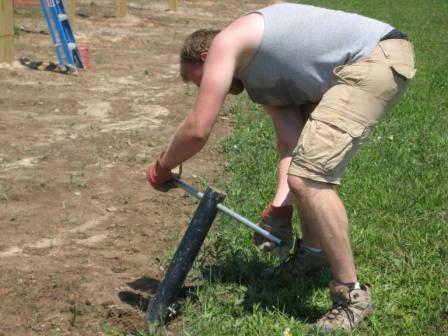 It is time to work on the trellis which will connect the poles. 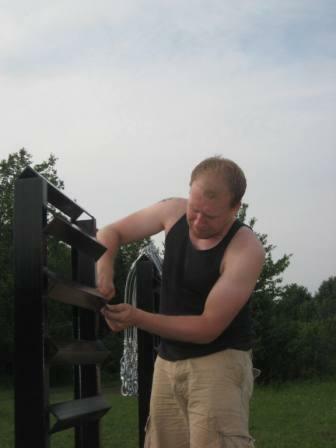 The first step was to prepare the anchors. 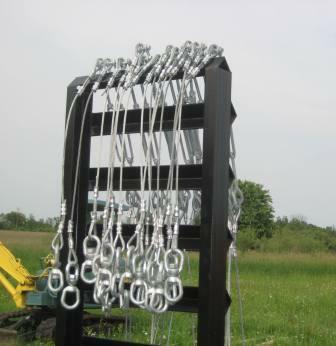 We have very large anchors. 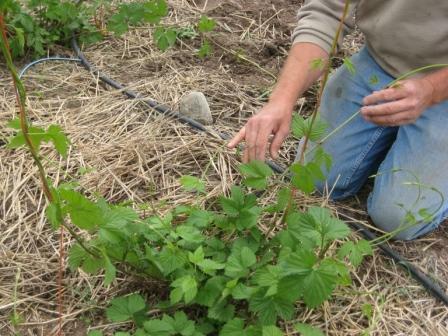 Sinking them into the stiff clay which lies beneath our topsoil was not going to be an easy task. 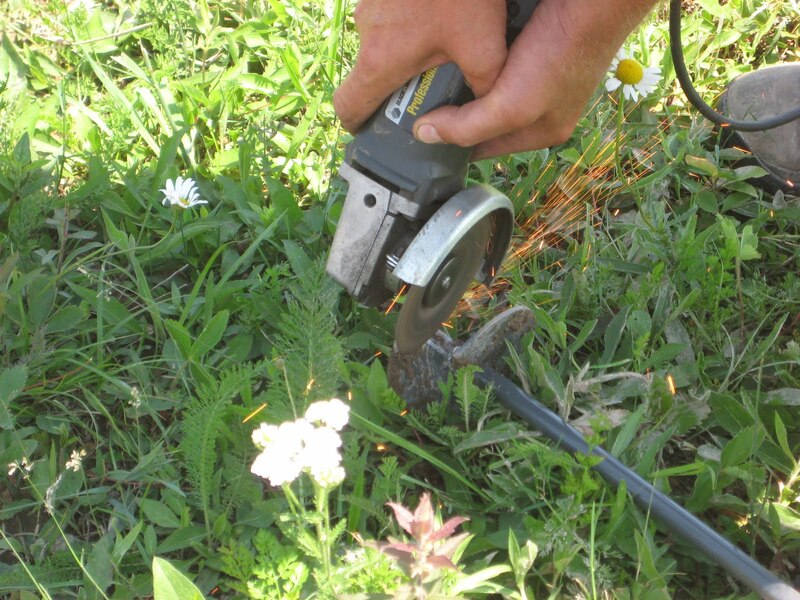 Howard uses his grinder to sharpen the anchor so it will cut into the soil easier. 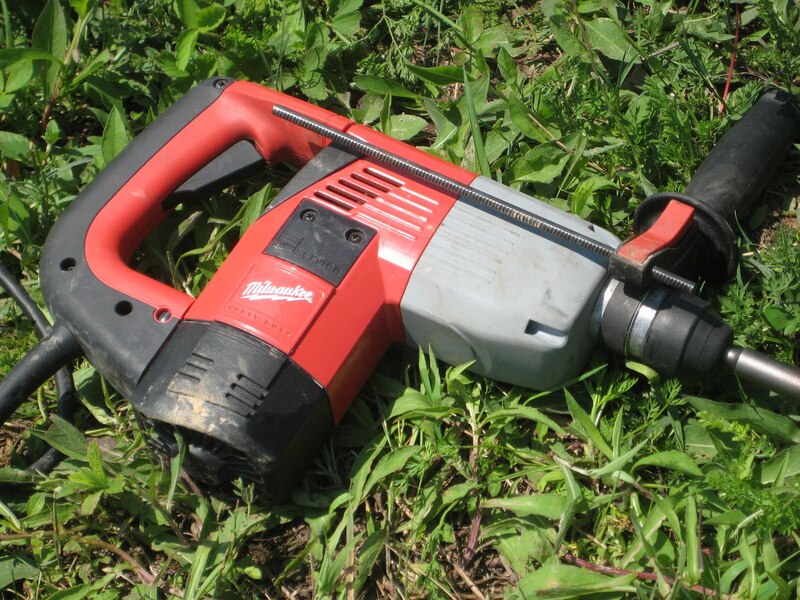 The power drill with an adaptor will be used to drive the anchor into the ground. The drill was working quite well. 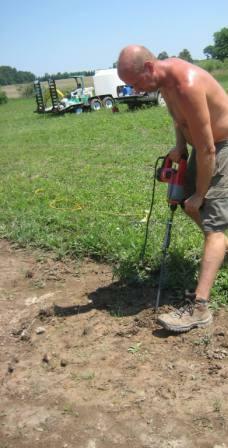 But after 3 or 4 anchors being set, the batteries used to power the drill ran out of energy. 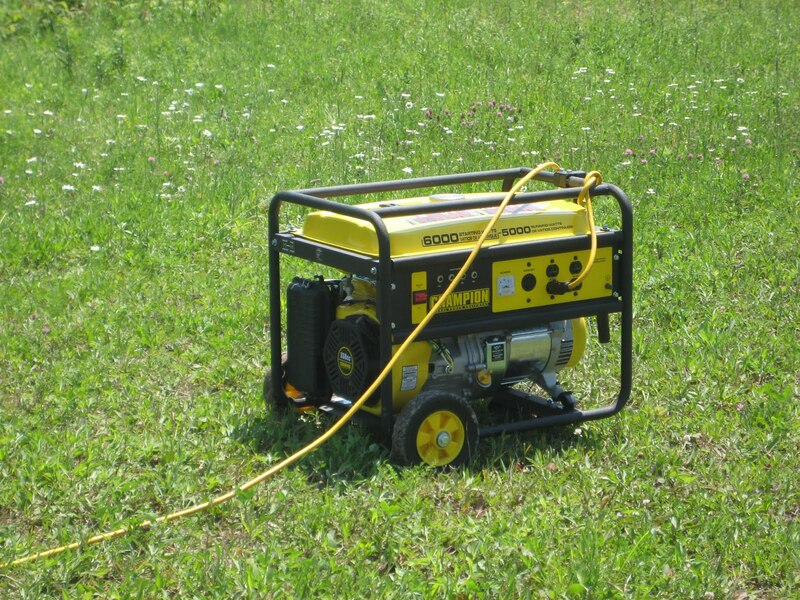 The anchors were quickly set after the generator investment was made. 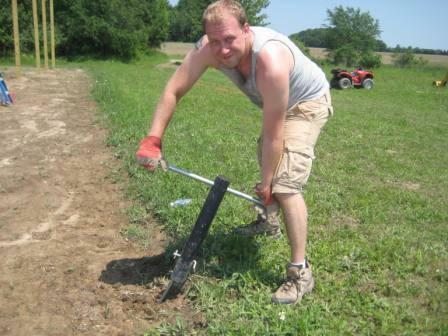 Howie provided the extra muscle power needed to manually drive the anchors the rest of the way into ground. 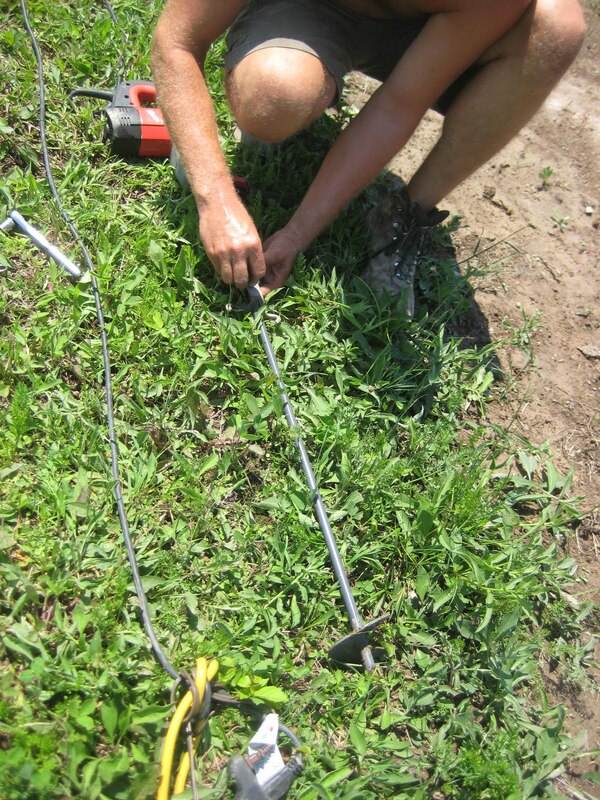 The next step was to prepare the cables which will connect the poles to the anchors. 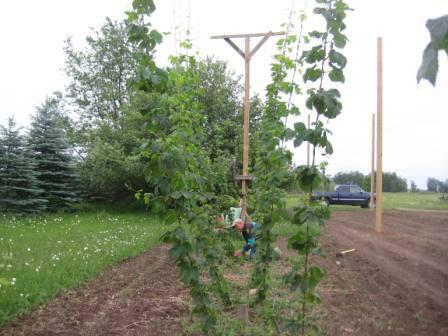 Meanwhile, our 1st year hops plants were growing faster than the trellis was being created. I decided that it would be worthwhile to establish a short mini trellis (7 ft tall) using the poles and old rolls of baler twine we had laying around from the hay making days on our farm. Amber and I had this task done in no time at all. 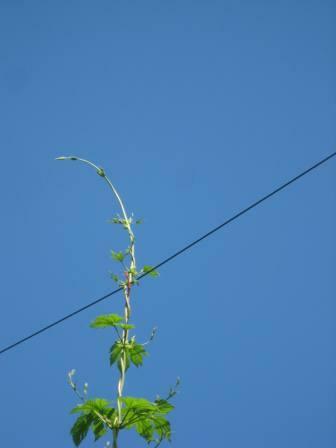 The baby hops plants were grateful to have strings to stretch upward on. 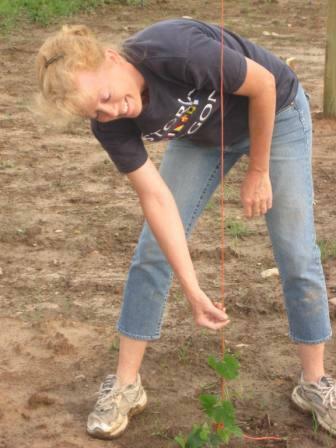 Each plant had to be wound clockwise around the string. I made the mistake of winding them counter-clockwise for the first 50 for so plants. ughhhh... I had to go back and rewind them.